We still have 323. It’s still hard. Students (like me) still complain about it. But in other ways, Yale CS is undergoing a profound transition. CS50 came to campus. New clubs like CodeHaven, Yale Computer Society, and Code4Good, have been created. The job recruiting landscape has changed. And of course, there’s the largest change of all — the explosive and unprecedented growth of the CS major. Note: Yale has a computer science major and 4 other combined majors (CS & Psychology, CS & Mathematics, Electrical Engineering & CS, and Computing & the Arts). I refer to the combination of all 5 as ‘the CS major’ below, which I think is fair terminology given that all the majors minus Computing & the Arts require the same set of core classes, and Computing & the Arts still includes a thorough foundation of CS. Source: Data for all charts in this section was obtained from https://oir.yale.edu/sites/default/files/w014_degs_yc_0.pdf, https://oir.yale.edu/sites/default/files/pierson_update_1976-2000.pdf, and email correspondence with the CS registrar. The CS major has seen serious growth, growing from just 14 people (that’s 1 person/residential college 😮) in the Class of ’09 to 116 in the Class of ’19. As a note, the figures for the Class of ’18 and ’19 are not final because these class years haven’t graduated and shouldn’t be taken to be as authoritative as data on other class years, but I’ve chosen to tentatively include them on the assumption that juniors and seniors very rarely drop their majors (and even if we exclude them, the pattern of rapid major growth still holds). This is a departure from the historical trend. This is the first time Yale CS has gotten this large. I tracked the major’s size all the way back to the mid 1970’s, and the major peaked at 38 students before this most recent decade-long growth spurt. I couldn’t obtain data from ’00 to ’06, but given that this was around the dot-com boom I think we can confidently estimate the numbers would have at best been slightly below/around 38. Where has this growth come from? All the individual majors have seen a general trend of growth. The vanilla CS major has been and still is the largest track, but interestingly enough in the last 4 class years (’16-’19) the vanilla CS major has plateaued while the combined majors have continued to see strong growth, led by EECS. The previous point illustrated the growth of the CS major in absolute terms. But how does the major stack up in relative terms to traditionally popular majors at Yale? I looked through data on major sizes and found 5 majors — Economics, Political Science, Psychology, History, and Biology — have dominated in terms of size in the last 10 years. Note that as with my methodology of combining all the combined CS majors into ‘the CS major’, I’ve done the same for other majors. Note: ‘Economics’ is a combination of the Economics, and EP&E (Ethics, Politics & Economics) majors. ‘Political Science’ is a combination of the Political Science, and EP&E majors. ‘Psychology’ is a combination of the Psychology, and CS & Psychology majors. ‘Biology’ is a combination of the Ecology & Evolutionary Biology, Molecular Biophysics & Biochemistry, and Molecular, Cellular & Developmental Biology majors. ‘History’ is a combination of the History, History of Art, and History of Science, Medicine & Public Health majors. If we take 5 year and 10 year averages of other majors and compare it to the size of the Class of 2017’s CS major, CS is still out of the top 5 but by a clear margin the 6th largest major. Moreover, if we take the projected size of the Class of 2019 CS major, then CS is already #5, surpassing Psychology. Source: Data for all charts in this section was obtained from https://oir.yale.edu/sites/default/files/w014_degs_yc_0.pdf, and email correspondence with the CS registrar. In addition to the number of CS majors, I looked at the no. of students in core CS classes from 2011–2012 to 2017–2018 and also found incredibly rapid growth. Source: Data for all charts in this section was obtained from https://ivy.yale.edu/course-stats/. The source records the no. of students who have enrolled in a class on the day course schedules are due each semester. 2017–2018 stats for CS 201, 223, and 365 are not included because they will be offered next spring (2018). In my observation, the rapid increase in class sizes has been readily felt by both students and the department, from the shift to larger and larger classrooms, the increased demand for more TAs and ULAs (undergrad TAs), to the feeling of knowing (and not knowing!) a lot more CS majors. Software is changing the world, and undergrads all across the country are — and have been — taking notice. CS became the largest major at Stanford in 2012, and CS was already the largest major at MIT in 2009. Of course, Yale is so different to both those schools that the comparison is somewhat unfair. So how are other schools in the Ivy League doing in comparison to Yale? Harvard? CS is the 2nd largest concentration as of 2016, passing even Government. Princeton? CS became the most popular major in 2015. Brown? CS just beat out economics to become the most popular concentration as of 2017. Cornell? CS grew 3.9x from 2011 to 2016, good for ~4.78% of all undergrads. Penn? CS grew 3x in the last 10 years, good for ~7.64% of all undergrads. 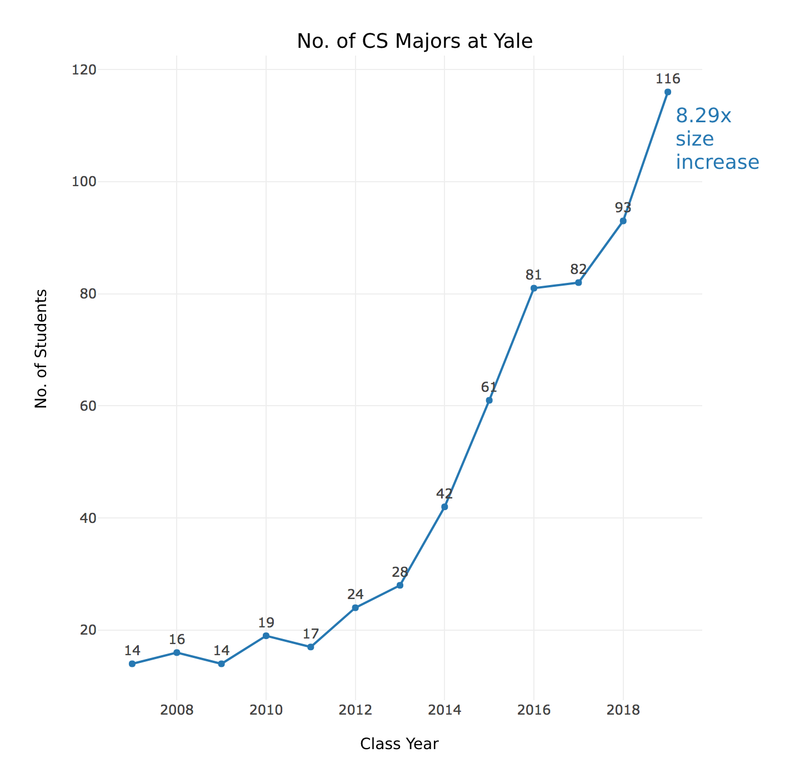 As a recap, at Yale CS is the ~6th largest major, has grown 8.29x over the last 10 years, and makes up (very roughly) ~6% of all undergrads. Thanks to Rachel Dwight, Daniel Sisco, and Mohammed Hussari for their help with data collection, and to Jessica Ambrosio and Eugine Szeto for reading my first draft and giving me invaluable feedback. This article would not be possible without their kindness & assistance. Thank you for being awesome!